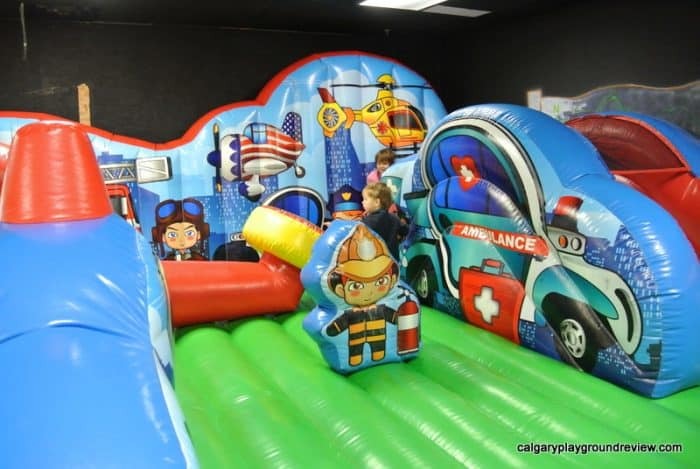 Nicky’s Review (4.5 years old)– “I liked the big bouncer best”. Safety Features/Concerns: It is difficult to see both rooms at the same time. Front door is gated and monitored by staff. 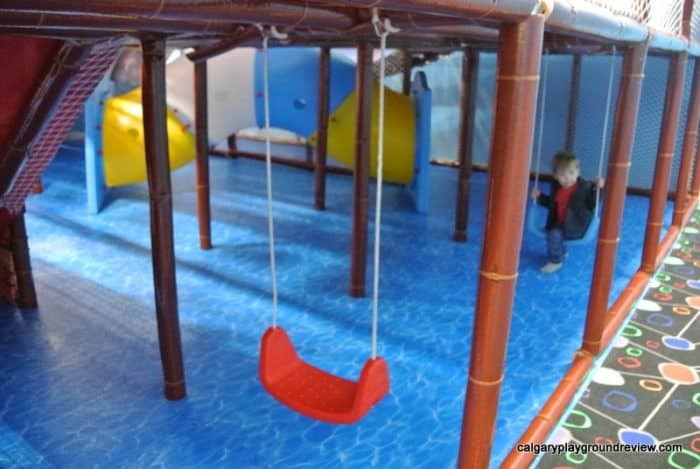 Play Area Features: Toddler climber and inflatable obstacle course. 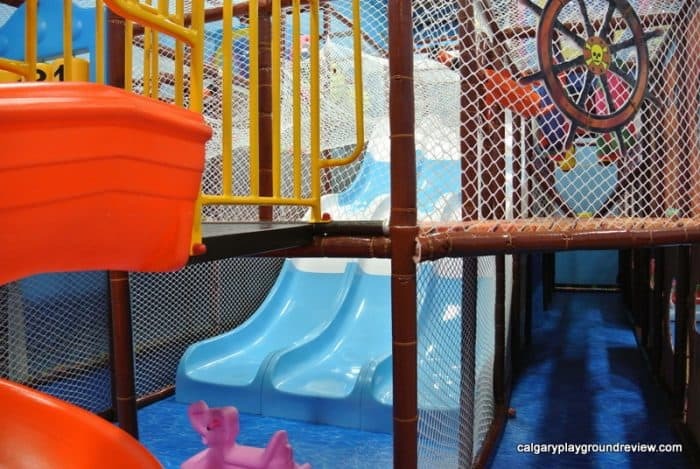 Pirate ship climber with slides. Bounce house. A small number of token games. Food Services: coffee machine and a small number of snacks and drinks at the front desk. Table service with things like french fries, burgers, chicken strips and pizza. 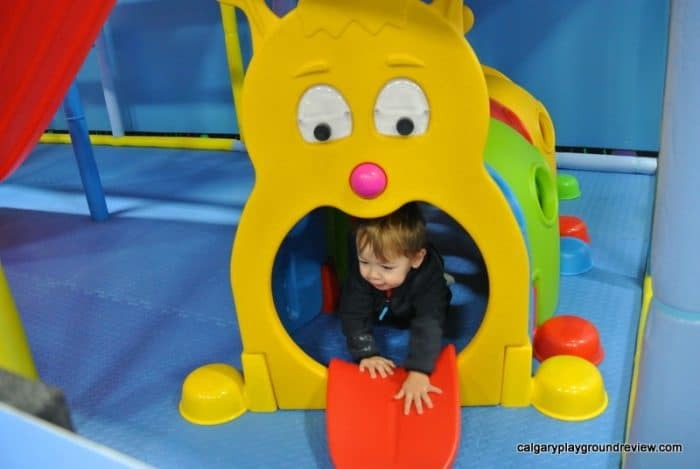 Overall Assessment: Fun City Play Centre is a medium sized play place. 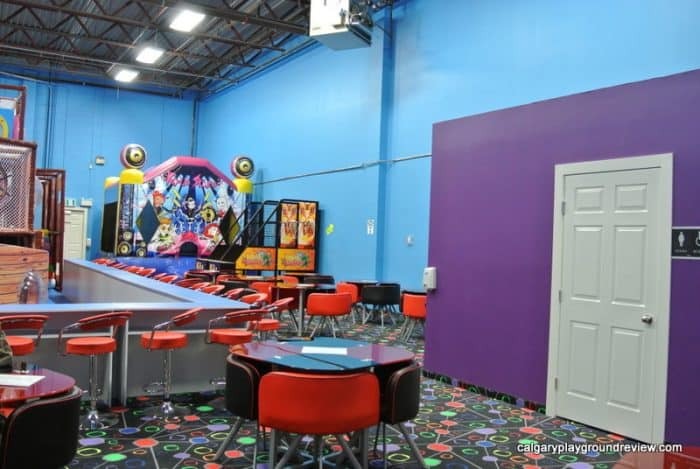 Big enough so that you can stay for a while and will entertain kids beyond the toddler years, but small enough so you can sit down and drink a coffee and not worry the whole time about where your kids are. 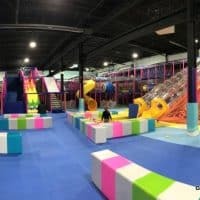 At the time of this review they hadn’t had their grand opening yet and they were still putting on some of the finishing touches. 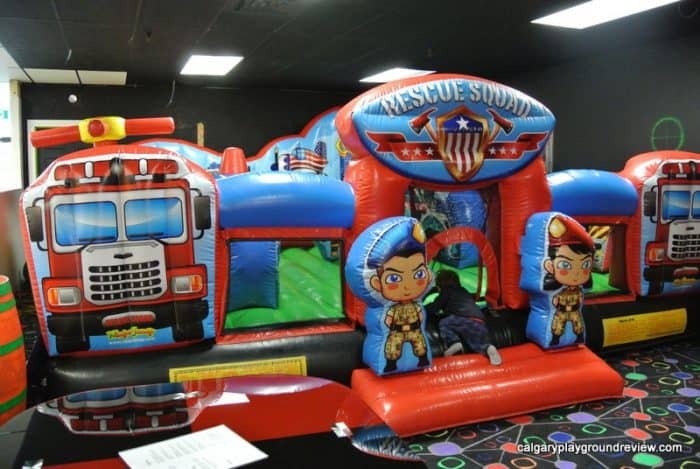 Recommended for kids 4 and under this big bouncy house has an emergency theme, and plenty of room to bounce around. 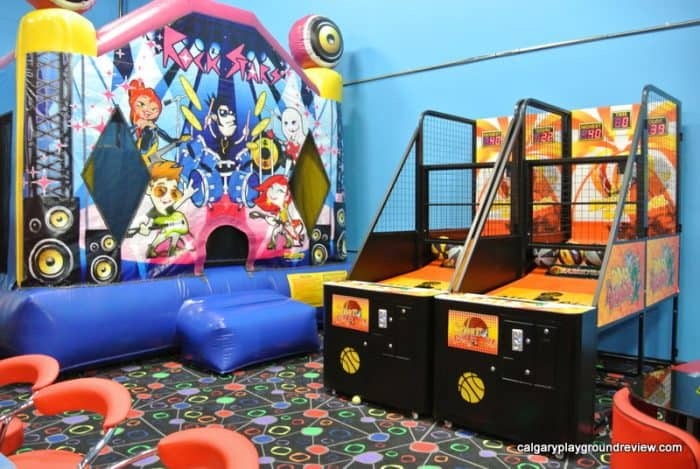 You can also sit inside with your kids while they bounce. 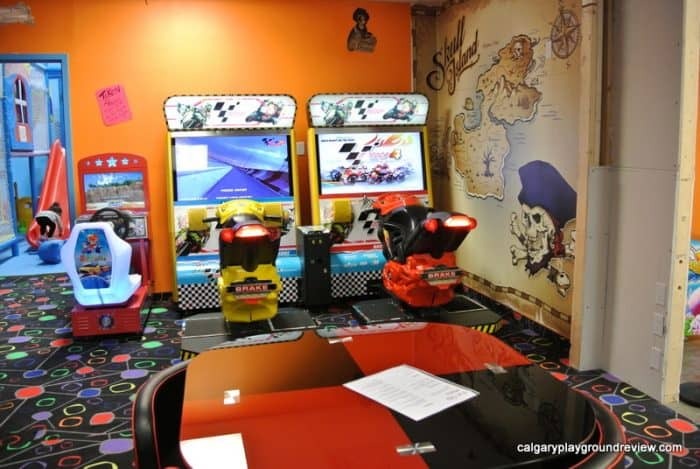 For an additional cost you can purchase tokens for several games located in a few different spots. 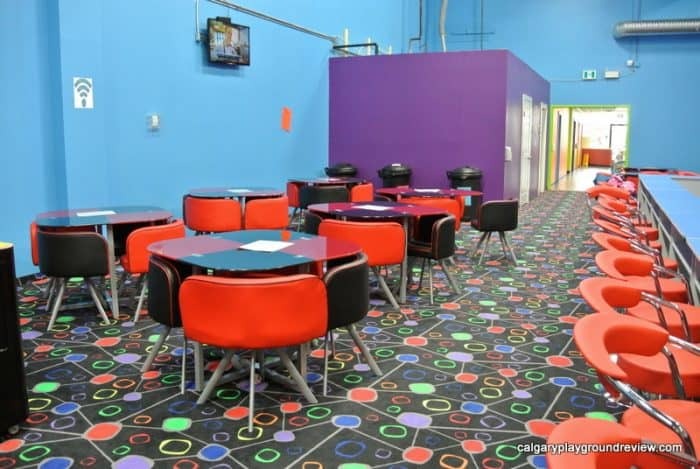 There is a lot of seating in the two rooms where you can hang out, watch the kids and eat. 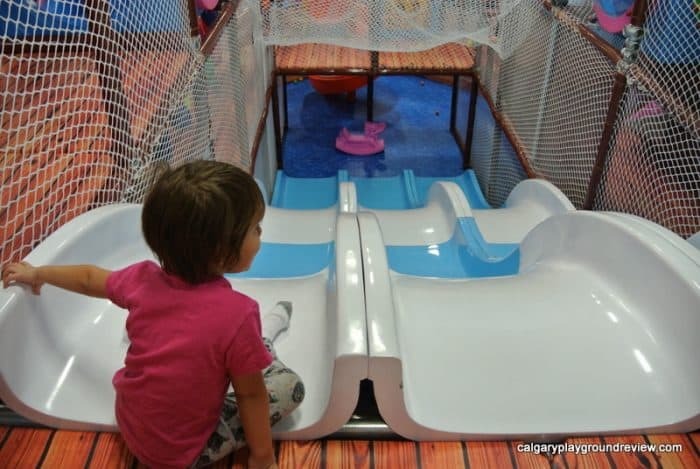 The toddler climber has a double slide and a catwalk like bridge which feels scary but is actually totally safe. My almost 2 year old was a little confused about how to walk across it but I think by his second visit he would have it figured out. 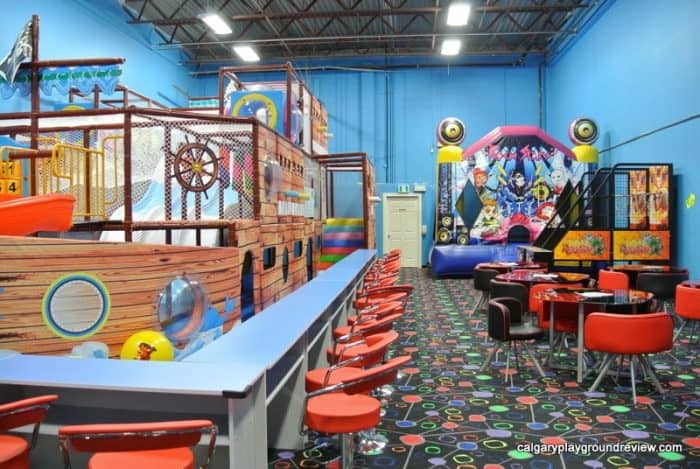 They also have a tunnel and some toys on the floor like balls for bouncing on and little teeter-totters. 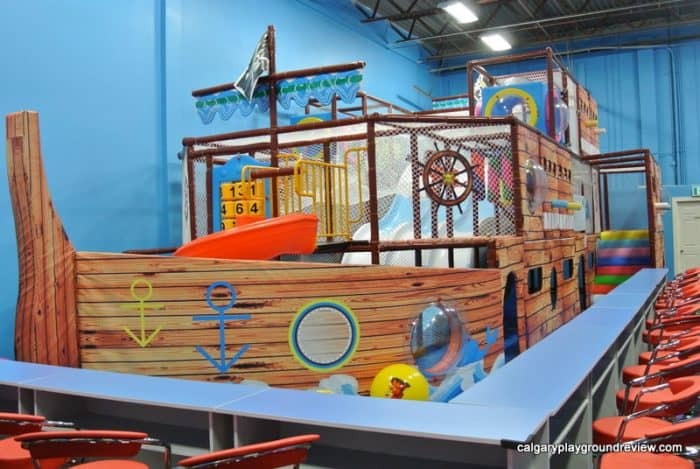 The bigger kid climber has a pirate ship theme with a twisty slide, triple slide, bumpers and more. 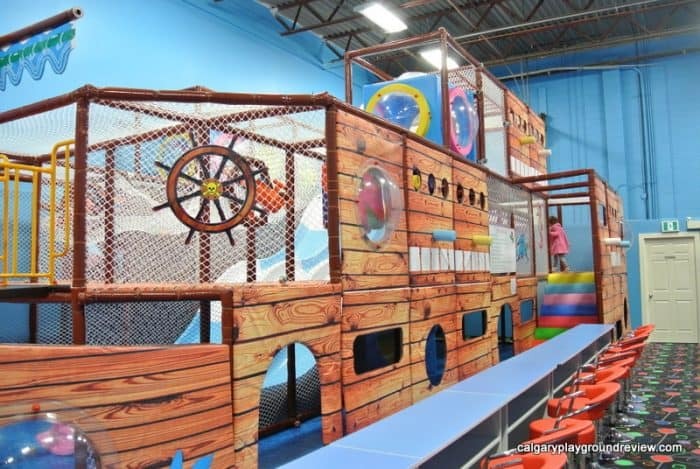 The climber is recommended for kids 5 and up. 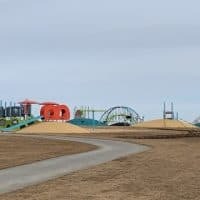 My 4.5 year old was able to easily navigate it and it wasn’t too hard for me to dissuade my almost 2 year old from going up. 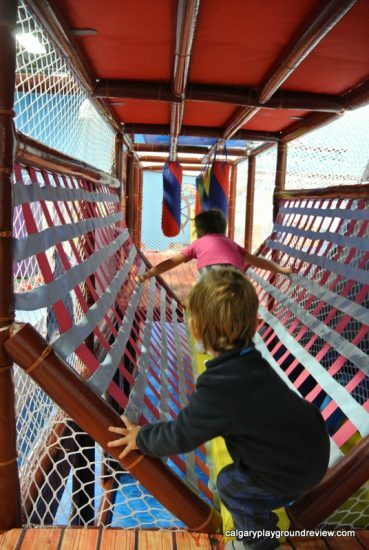 The climber is small enough that you can easily keep track of your kids even if you have younger kids that want to venture up. My little one went up once and I took him back down the triple slide which I do not recommend. They warned me that the slide was new and really fast and it is. 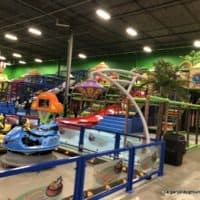 My 4 year old thought it was a blast though. They also have a few things to play on under the climber. 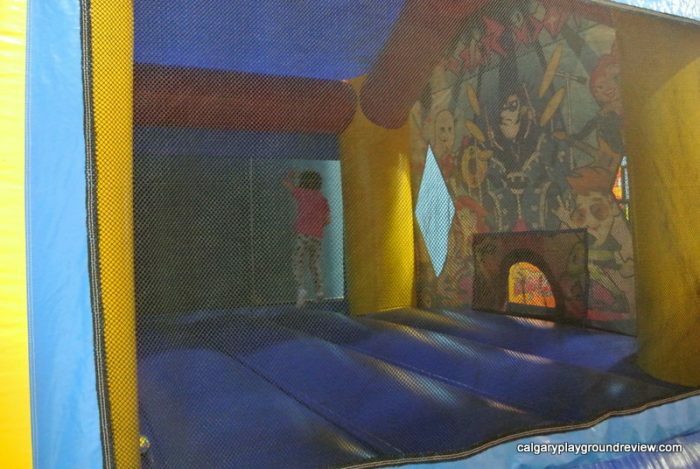 My daughter’s favorite thing was the bounce house at the back which she had all to herself while we were there. 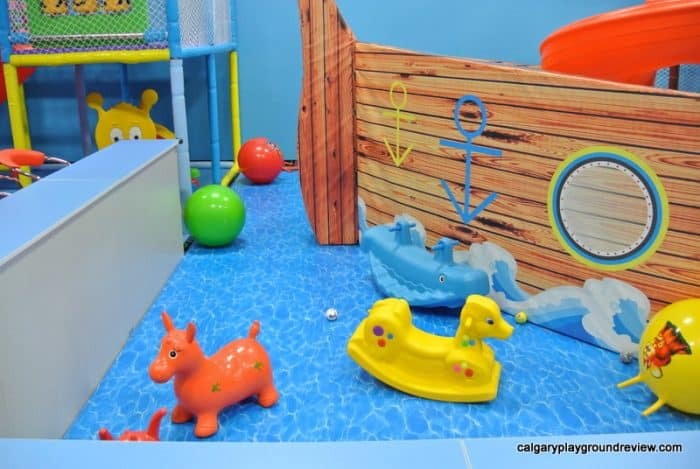 Fun City Play Centre looks to be a great new addition to Calgary. 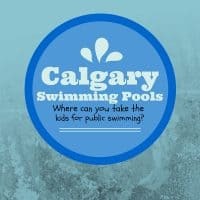 If you are looking to chat with a friend while your kids play or have kids of different ages you are trying to keep track of this is a great option. 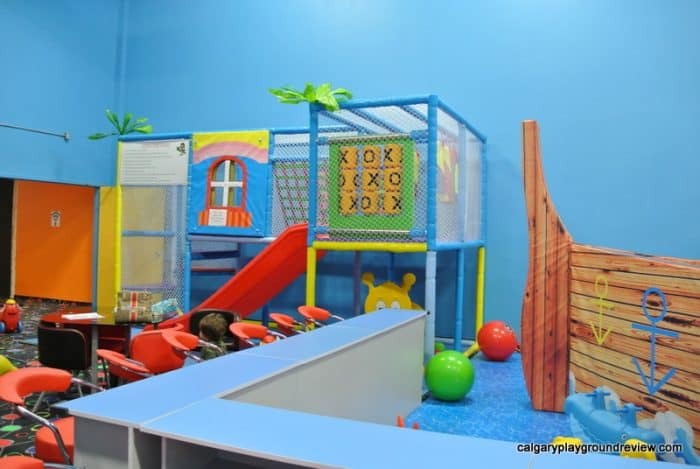 Have you been to Fun City Play Centre? What did you think?